We’ve all grown to love Gerry’s Grill, that food joint made famous by its sizzling sisig, that very awesome crispy pata, and the very tasty tinomok (that’s laing with meatballs for you). Despite Gerry’s being a regular fixture in our dine and drink list, the restaurant is urging us to do something different in their next charity event: run and ride. 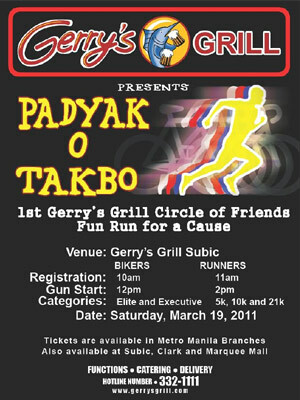 The event is called Padyak o Takbo: Gerry’s Grill Circle of Friends Run for a Cause. It wants us to put the pedal to the medal for the benefit of the GMA Kapuso Foundation, ABS CBN Foundation and for the Athletes in Action, an organization of Cancer survivors. This benefit running and cycling event will be held at Gerry’s Grill Subic on Saturday, March 19, where you’ll find plenty of members from Gerry's Circle of Friends club. Registration time for bikers will be at 10am, gun start at 12nn. Runners meanwhile can come in and register by 11am and race by 2pm. You can chime in ala-Coach Rio and run their 5k, 10k, or 21k courses, or you can try the bikers open elite and executive categories. All the same, a hearty meal will be waiting for you at the finish line. It’s like exercising in exchange for all the free chibog. Awesome! The registration fee for the running event is Php750. But if you're a Gerry’s Grill Circle of Friends member, you get a Php50 discount. The cycling event, on the other hand, will have a registration fee of Php500. Folks can still sign up and register in all Gerry’s Grill branches – save for branches in SM Manila, SM North Edsa, SM Mall of Asia, and Congressional – up until Tuesday, March 15. So how about we do this for the charity, or better yet, for good food’s sake, yes? For more info on this event, check out Gerry’s Grill’s Facebook fan page.